the scent of green bananas: chirashi for hina-matsuri. Posted by santos. This entry was posted on 20060304 at 11:12 PM You can skip to the end and leave a response. How beautiful! and yummy-looking, too. You're making me hungry! I heart scatter sushi rice - there's something about it that makes me want to eat bowls and bowls of it! i think it's the lazy side of me - it's like a deconstructed hand roll. OH MY how did u take such marvellous pictures? hi kathleen, it was very yummy. 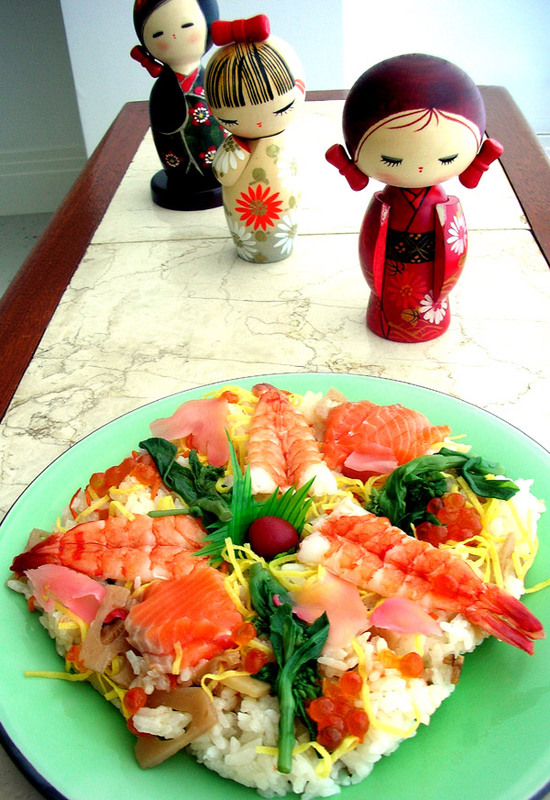 the nice thing about chirashi is you can pick whatever you like for the topping. hi bex, i'm the same way--i could eat bowls and bowls of it. i like that description--it is a deconstructed hand roll! hi missnerdberd, with a camera :D actually, it's good looking food, i didn't have to do much. this sushi thingie has just arrived here in athens recently. or maybe u have a superb cam! :D lovely indeed! hi sha! really? no sushi until now?! wow, that's sort of crazy, but i guess it's understandable. no. no it's not! there's rice, there's fish there--they could have put it together sooner. hi missnerdbird, my camera's very ordinary, just a nikon coolpix S1. not too expensive, not too fancy. I love your blog!!!!! Where did you get your kokeshis? hi anon! jun gifts--great selection!